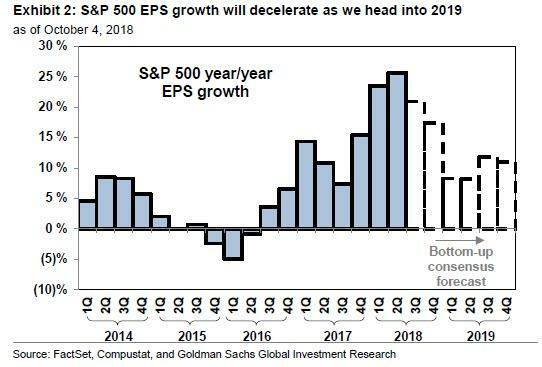 Over the weekend, in his preview of Q3 earnings season, Goldman's chief equity strategist said that whereas company earnings will most likely be stellar for yet another quarter, with 3Q EPS for the S&P500 growing by 21% Y/Y, what investors should focus on is company guidance about Q4 and the longer term especially as pertains to profit margins, with Goldman laying out three key risk factors: 1) tariffs, 2) wage inflation, and 3) interest rates. In other words between rising costs, slowing Chinese demand, higher inventories, and a strong dollar eating away at foreign sales, and suddenly what was the bedrock of US corporate stability is looking extremely shaky. And, as Yahoo Finance notes, "sometimes companies will flag one or two or these as weighing on business, but PPG’s third quarter was hampered by all four." More importantly, PPG is hardly the only company dealing with these stresses. Expect many more to cite precisely the same litany of concerns in the coming weeks. In any case, as a result of this wholesale disaster, PPG now expects to earn adj EPS $1.47-$1.51 in Q3, below consensus estimates of $1.59, and a sharp drop from the $1.90 the company reported in Q2. Q3 Revenue is forecast to be $3.8 billion, the same as a year ago and down from $4.1 billion in the second quarter. But it was the guidance - as Goldman warned - that sent the stock crashing after hours: PPG now expects Q4 EPS to collapse to just $1.03-$1.13, nearly 30% below consensus estimates of $1.32. Meanwhile, contrary to Fed presidents noting just how easy it is, in theory, for companies to pass through prices, in PPG's diametrically opposing reality it was forced to work "proactively with its customers on higher selling prices to recover margins." Hardly the stuff that keeps inflationary pressures at bay. What is also notable is how unforgiving the market has become to both (soft) earnings beats, and certainly misses (coupled with a guidance cut). As Bank of America calculates, among the companies reporting results over the last few weeks have seen investors punish poor quarters, with the average one-day stock reaction to results coming in at -1.2%. For companies that miss expectations, the average reaction in the second half of September was a drop of 3.5%. With PPG, which is down 9% on the news, the trend is certainly holding. Finally, if it took just one day for Goldman's ominous profit margin observation to be validated in practice, and with the market already having long priced in stellar Q3 earnings, peak earnings expectations may already have been reached, especially as many more companies will take advantage of what may be the last strong quarter to kitchen sink guidance in hopes of receiving a more lenient sentence by the market.